On arrival you will be greeted by our receptionists, Bridget, Lindy, Jess and Naomi who will ask you to fill a form in with your details and consent to treatment. Your physiotherapist will come to the waiting room to meet you and take you to the treatment room. 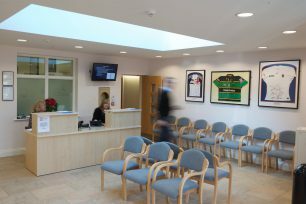 We have nine treatment rooms, three of which are on the ground floor. Please call us in advance of your appointment if you are unable to manage stairs and we will try to arrange for a ground floor room. Your physiotherapist will first discuss the nature of your problem with you, asking such questions as where the pain is and how movements or positions affect it. He or she will then go through the history of the condition and ask a number of relevant questions to help in diagnosis and treatment. This part of the assessment is called the Subjective Assessment and forms the basis of a thorough examination. Please be ready for a lot of questions! Physical examination can vary from part to part and person to person but will generally start with looking at active movements. These are normal movements that the patient performs and the physiotherapist observes. The physiotherapist is looking for the range and quality of the movements, either in standing or on the bed. The next phase deals with the passive movements where the physiotherapist holds and moves you themselves to get a feel for the area. This gives the physiotherapist a lot of information regarding the stiffness, spasm and general ‘feel’ in the area. Your physiotherapist will always need feedback from you regarding your symptoms. Muscle strength, length and stress tests follow, which tell us how strong the surrounding muscles are and how well the area is controlled. Accessory movements and tests are specific tests that are relevant to the particular problem you may have and can consist of small movements of the joints, ligament stress tests and recruitment tests of the muscles. These are performed on you by the physiotherapist and often need a lot of feedback. Finally, the area will be palpated which means a lot of ‘prodding and poking’ looking for swelling and tenderness and also the texture and again the ‘feel’ of the problem. Physiotherapy is a hands-on profession and skill. Physiotherapists develop an acutely sensitive ability to feel a problem and this is as important to a good assessment and treatment as any scan or test. At the practice, we have detailed testing equipment such as a treadmill for gait analysis and power gauges for the specific testing of power and joint control. If necessary for the assessment your physiotherapist may use these to help gain further information. Physiotherapists have a huge number of treatments at their disposal. This ranges from manual mobilisation, manipulation, exercise, electrotherapy, gym-based rehabilitation, acupuncture, and posture and movement re-education. We are a hands-on practice, which means that our normal approach would be to mobilise an area using hands-on techniques from massage to manipulation of joints, both spinal and limb, and soft tissue – muscle, ligament, fascia and tendon. This could be supplemented by advice on exercises to help maintain mobility and improve function and strength. We have a software package, Physiotools, which allows us to print off exercises with pictures and detailed descriptions for you to take home to help you perform the exercises correctly. Over many years we have developed our own protocols for common conditions based on the approach we find works best. Your treatment may also include some electrotherapy or acupuncture to supplement your body’s natural healing processes. We have a range of electrotherapy including ultrasound, interferential, pulsed shortwave and laser. We also have TENS and muscle stimulators for loan or purchase. Please read through our Case Studies to give you a further flavour of the work we do. It is normal for us to assess and begin treatment in the first session. We do not have longer sessions for the assessment and then shorter for treatment because we reassess each time the patient comes in. We find that 40 minutes is the average time required to provide the best service. We cannot do a proper treatment session in 30 minutes and find that an hour for an assessment is often too long. Thus we run to 40 minutes and this works well for us and our patients.